Buffalo, NY– I’m at the Erie County Medical Center, dropping off some furniture that I picked up at Elkhart IN. A nice little stretch of the legs. I’ll be back at the yard in a few hours and ready for my next adventure. This trip out west is likely a rare event, but I must say I woldn’t mind it happening more often. I’ve been getting a bit tired of New York City. That said I’ll doubtless end up there in the next day or two. Leadership? Which way? I’m convinced, in talking and reading, that there is enough momentum in the rank and file of the GOP… and, after Obama, many rank and file Democrats, for that matter, to put a real conservative in the White House and in most seats in both houses of Congress. That said, I’ve also become convinced that the GOP leadership, which has been tilting increasingly to the left for generations now, is our sole roadblock to getting a real conservative in the White House. With the current GOP circles, the party of Reagan has become indistinguishable from the party of Obama. That’s the thing about compromise…. you meet the other fellows demands half way each time. If we meet the Democrats half way every time.. as we’ve been doing mostly since FDR, we end up going to where the Democrats want us, only more slowly. I fail to see a slow death as an advantage. The GOP leadership isn’t listening, still. I feat it may already be too late to save ourselves… which we won’t if we don’t get real conservatives in positions of power. And now. Names? I don’t know if it’s precisely true or not, but based on what I”ve seen, there must be a “Mud Creek” in every county in the country. Not very imaginative, though in most cases, descriptive. Names and The Obama Legacy: There’s a fair amount of blindness demonstrated on the part of the Black voter, daily. One might even call it racism. Obama has been a bloody disaster by any objective measure, even in terms of advancing the fate of blacks in our cosiety….,and yet he still maintains a fair lead among black voters. A self-destructive thing, perhaps? This suggests an interesting fate for him in the near future…It strikes me that just about every city in the country has a “Martin Luther King Blvd”. Almost without exception this runs through the worst section of each city. Ironic, since most people who insisted on honoring his name, had so little in the way of clues about what MLK actually stood for. King, for all his efforts never really overcame poverty in those areas, because the biggest task…. changing the minds of his black followers… he was largely unsuccessful at. Sad, really. The moment he was killed…. people like Jesse Jackson stepped in and reversed what work King had been successful at, there. 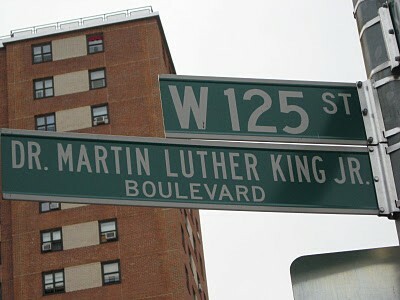 I submit that many people will further insult the memory of MLK by insisting that streets in these same areas should be named after Barack Obama. This seems to me more accurate, than the nods to MLK since it is the Obama philosophy…. which is really Marx in Black face… and which is the philosophy MLK spent his life fighting against…. and which have created the conditions under which people on those streets live. Personally, I’ve taken to calling such neighborhoods “Obamavilles”. That said, Poverty isn’t what it used to be, as Bruce points out this morning. Kinda gives a different read on the cries of ‘black poverty’, hmmm?